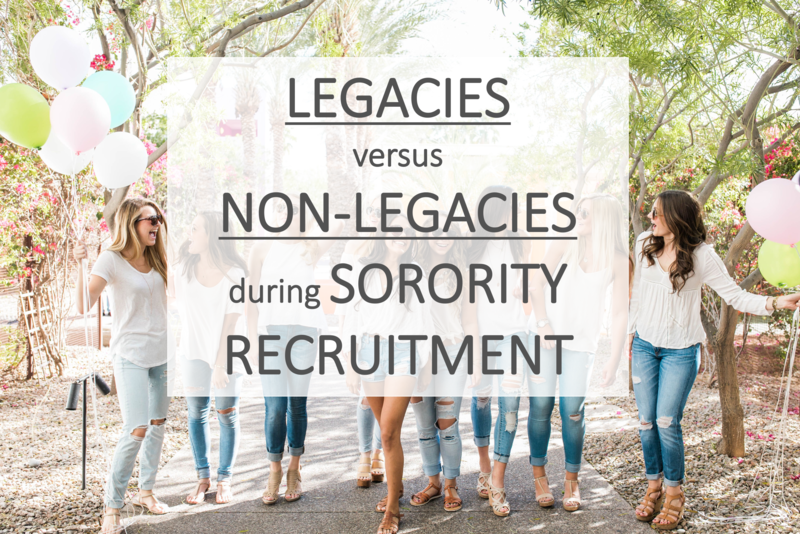 Legacy Status: Does it Help or Hurt During Sorority Recruitment? Let me begin by saying that you absolutely do not have to be a legacy (meaning your mom, sister, or grandmother pledged a sorority back in the day) to join one yourself and enjoy all the amazing aspects of sisterhood. If you’re excited to join a sorority – don’t let that hold you back for one second. On the flip side, legacy status does not mean you’re automatically in, either. It helps, but it’s not a guarantee. Chapters don’t automatically vote to take all legacies because, if they did, they would have entire pledge classes, and maybe even entire sororities made up of legacies. That wouldn’t be very fair to those potential new members (PNMs) who didn’t have that legacy status, right? Instead, sororities vote to take a certain percentage of the legacies that meet their chapters pre-determined qualifications (aka – GPA minimums, leadership skills, good moral character, etc.) during recruitment week. This varies from school to school and sorority to sorority. It ensures that if 300 rushees happen to be legacies, the chapter isn’t required to offer than all a bid all at the expense of the wonderful non-legacies signed up for rush. As for the percentage – and which specific legacies this means – is left to the chapters vote to determine. The legacies with more “yes” votes during recruitment move to the top of the list (chapters are required to list legacies at the top of the bid list), and the legacies without any votes, or negative votes, are less likely to get a bid. Thus, it can be helpful for certain potential new members, and not carry much weight for others. This is great news for ladies without legacy status, because they have purposefully saved room for you to join! This is in reference to cross-cutting, a popular term at schools with a competitive sorority recruitment process. It’s referring to the possibility of a PNM getting “cross cut” from a specific sorority because the sorority assumes the PNM will want to pledge a particular house over theirs. A common example is a rushee participating in recruitment that has a sister that’s an active in a popular sorority house on campus. Often, she will choose the sorority that her older sister is currently in (especially if it’s a well-respected house on campus) because all those girls will be pulling for her and SO excited she’s there. Sometimes, cross-cutting legacies does happen; it’s not a perfect process. However, a lot of recruitment teams discourage this practice. After all – maybe the rushee has an open mind and would LOVE their house, or maybe she wants a different house than her sister. You never know. For every house that’s inclined to cross-cut, there are so many more that try to give equal consideration and fair treatment to each girl going through. After all – we’d want our future legacy daughters to have fair and equal consideration someday. Either way, listing legacy information on your sorority recruitment resume is a delicate process these days. When listing legacy information (or sorority affiliations for that matter), there’s definitely a recommended way to go about it. We’d recommend working with a professional to check out your materials before you submit them (the application and your sorority recruitment packets). What’s a sorority rush coach, and should you partner with one if your daughter is participating in sorority recruitment?